AULT, Colo. — Union Pacific Railroad is inspecting a Weld County railroad crossing after Contact7 started asking questions. A local woman said a piece of metal sticking out of a railroad crossing punctured her tire, and now she said, the railroad company is making her jump through hoops to get it replaced while the crossing is still a danger to drivers. Just outside the town of Ault, near the intersection of Highway 85 and Colorado 14, Debra Barnes' tire abruptly blew out while she was driving over the railroad tracks. "I think it's dangerous. I think it could cause an accident," said Barnes, showing the corner jutting out from the crossing area. "This is the area that caught my tire. It's like a knife." She said the metal slashed the sidewall of her tire, and she had to wait three hours for help getting it changed. She said not only is Union Pacific making her jump through hoops, including two different estimates and two tread depth measurements, but the company will just pay for one tire. "It's $578.96 for two tires," said Barnes. "My vehicle — the EBS and the cruise and all the braking system — will be thrown off if I only put one random tire on it. I told them I live on $1,000 a month, and that would require me going without medicine or food or something like that. And they don't care. I just kept getting the same response: 'It is what it is.'" On top of that, three weeks after it happened, she said the crossing is still the same with a metal corner sticking out as people drive over it. "No telling how many people are getting their tires slashed," she said. "I want them to fix it, and I want them to replace two tires." Contact7 requested an interview with Union Pacific. In a statement, a spokeswoman apologized to Debra, telling Contact7 the railroad is sending an inspector to determine if repairs are needed. 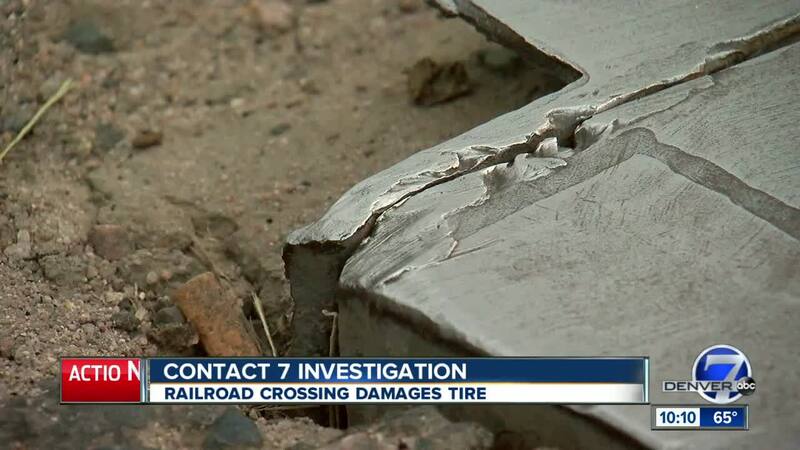 However, even though the railroad acknowledged the rough crossing caused the damage, they say it's in line with an industry standard to only replace the one tire damaged.